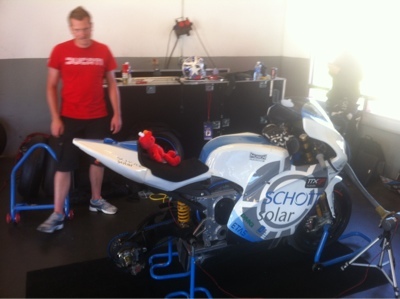 We just had the qualifying round for the TTXGP and as expected Brammo and Muench came in the fastest. 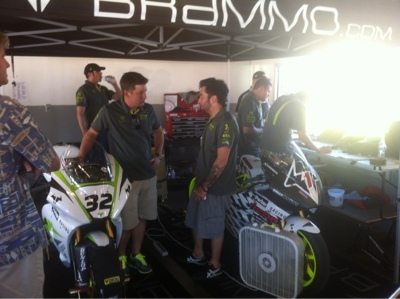 Brammo's two riders came in 1st and 2nd with Eric Bostrom barely edging out Steve Atlas to take the pole. Both looked fabulous on the track and were going so fast in front of us it was impossible to take their picture. But, both had some trouble. Bostrom hit a dragonfly while riding and it smeared his visor. But more seriously, both riders came into put lane complaining the bike kept cutting out and they had to reset while riding. Both were hitting speeds near 170 miles/ hour. Meunch's matthias Himmelmann looked great and fast but because it was easier catching a picture of him I could tell he was a bit slower. Indeed, his best lap time was 2:04.897 and best speed was 101.171. Catavolt came in not even finishing one lap. The motor was leaking coolant - this is a liquid cooled hub motor which is by itself rather amazing. 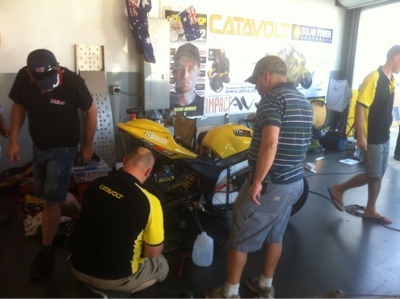 Unfortunately things do not look well though the team was gamely working on the bike when I left the track and they may well get it running again. 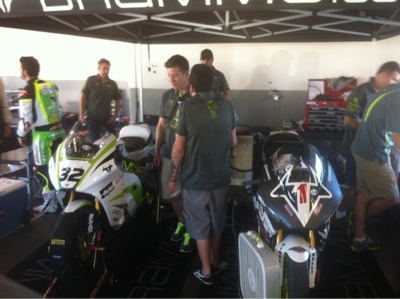 In practice round they had a 2:33.732 best lap time and best speed 82.105. Those who'd seen them in practice said they looked great. Jeremiah Johnson was the most reliable rider out there. We should not be surprised as its been the Zero's that have been most reliable all season. His best lap time was 2:50.624 and best speed 74.058. By the way is was real easy to take pictures of him. The pictures I mentioned will be in a different posting. These may just be bikes, but it still shows the potential of e-cars. I honestly wouldn't be surprised to see more people buy cars you plug into a socket soon enough.